Skid Road and Pioneer Square were the center of the young city of Seattle. In the 1850s, early settlers built sawmills to exploit the timber resources of the area. They moved their logs by "skidding" them down the steep hills above the settlement, a practice which gave the main route--now known as Yesler Way after the first mill's founder--its name. The area's present appearance, however, is linked to two defining moments in Seattle history. On June 6, 1889, a fire roared through the wooden, frontier-style business district, turning most of it to ashes. The city launched a massive rebuilding campaign, adhering to new "fireproof" building codes that required the use of brick, stone and iron. In addition to these requirements architect Elmer Fisher, who designed many of the new buildings, favored the Richardsonian Romanesque style which lead to a unity of appearance. The second crucial development arrived on July 17, 1897, when the S. S. Portland docked with more than a ton of gold mined from the Yukon. Seattle became America's most important point for travel to and from the Klondike, and the need of "stampeders" for hotels, equipment and mining offices spurred a boom centered in Pioneer Square. The diversified economy and the confluence of different modes of transportation allowed Seattle to expand rapidly during the first part of the 20th century. 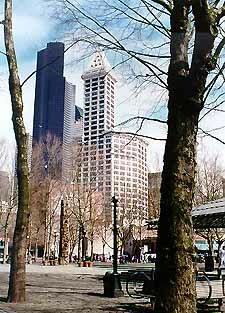 Though the area continued to grow through the 1920s, Pioneer Square suffered once Seattle's business core began moving northward before World War II. In the 1970s, the city aggressively began to reverse nearly two generations of decline when it designated the Pioneer Square area as a historic district that now includes about 88 acres in downtown Seattle. Residents and visitors began to appreciate its historic resources, and the area is once again crowded and prosperous. The Seattle of a century ago is now recalled in the district's skillfully restored examples of Second Renaissance-Revival, Beaux-Arts Classical and Richardsonian-Romanesque architecture. The Pioneer Square-Skid Road Historic District is roughly bounded by Columbia St., Elliot Bay, Second Ave. South, Fourth Ave. South and Fifth Ave. North. The district is a commercial area and open to the public during regular business hours. For more information call 206-622-6235 or visit the Pioneer Square website. The Underground Tour offers a subterranean tour of what was once the main roadways and first floors of Pionner Square. 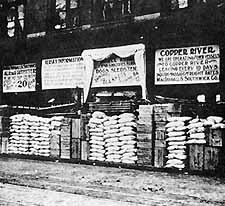 Pioneer Square and Skid Road are discussed in the Klondike Gold Rush National Historical Park online-lesson plan produced by Teaching with Historic Places, a National Register program that offers classroom-ready lesson plans on properties listed in the Register. To learn more, visit the Teaching with Historic Places home page.